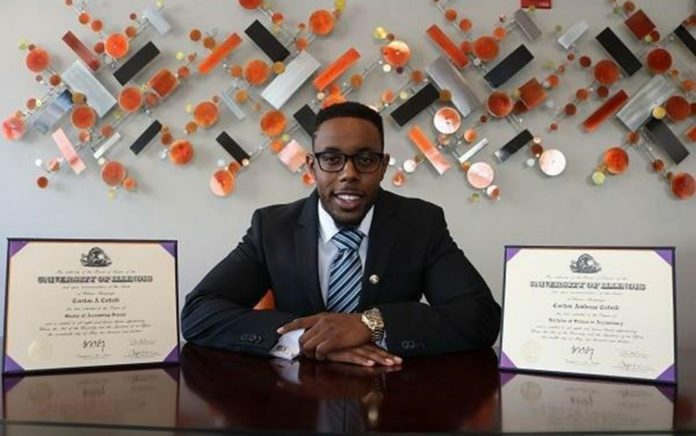 Cortlon Cofield may be young, but when he saw a need in the financial marketplace he created a company to address it. Cortlon started Cofield Advisors in the summer of 2017 because he noticed his peers struggling with their finances and knew they weren’t alone. Cofield, a Certified Public Accountant (CPA) and Personal Financial Specialist (PFS) licensed in the state of Illinois with a Master’s degree in Accountancy, grew up in Chicago?s South Side. He had yet turned 17 years old when both his parents passed away within two years of each other. He concentrated on his education despite the hardships, acing a 27 on the math section of his ACT. He went on to attend the University of Illinois at Urbana-Champaign and after receiving his master?s in accounting, Cofield earned his CPA license. He worked at Big Four firm KPMG and Northern Trust Asset Management before going out on his own. Cofield gives TNJ.com the details on how and why he became an entrepreneur. TNJ.com: How did you get into this field? Cortlon Cofield: Well, I?ve always been the person that friends and family go to for financial advice and I loved helping them. Once I realized that I could pursue it as a profession I took full advantage of the opportunity. It combines my two best traits; my natural knack for numbers and my ability to develop trust with people within moments of meeting them. TNJ.com: What made you want to become an entrepreneur? Cortlon Cofield: Well, entrepreneurship was kind of forced on me. I saw a need in the industry and no one was willing to take the chance to solve the problem. I literally spent days searching for firms that do what I do, but I simply couldn?t. This made me take the jump into entrepreneurship, and I?m so glad I did! Cortlon Cofield: I launched my firm because there was a need for millennials to have access to financial planning services. The main problem was that the traditional financial planner/advisor would charge their clients based on AUM (assets under management). With this pricing structure, most planners would charge a 1% AUM fee, so if they managed $1 million, that would receive $10,000 for a year of work. The problem with most millennials is that they haven?t worked long enough to accumulate such a large sum of money so financial planners would just overlook them. Cortlon Cofield: My biggest start up challenge was getting exposure. I had to let a group of people who had been underserved for decades know that someone was finally here to help them. In addition to the challenge of gaining exposure, I found myself having to counter the stereotype of my industry. For as long as we can remember, financial planning was geared toward old wealthy people. I had to now shift my clients? mindset to understanding that they not only have access to this service, but they need it as soon as possible. TNJ.com: What makes your company stand out from others in their field? Cortlon Cofield: As I mentioned, I decided to target a market that others wouldn?t dare touch. It?s a staple in the financial planning, and the wealth management industry tends to stay away from millennials and other young people because they feel it?s impossible to run a profitable business serving them. I went against the status quo and have found a way to serve my peers and change their lives for the better while making a profit for myself. I also don?t sell any financial products or insurance; I operate as a fee-only fiduciary financial planner, which helps gain immediate trust with my clients. TNJ.com: What has been your best business lesson? Cortlon Cofield: Mind your business. I mean this in the most respectable way possible, but it is vital that entrepreneurs learn to ?mind their business.? What I mean by this is focus your attention on what you?re best at (what makes your business money) and outsource other tasks. For example, I spent three weeks building my website, which still turned out pretty crappy. That time should?ve been spent meeting clients and developing my firm. I now have a website design company that handles all of my website and technical issues and it frees up my time to focus on servicing my clients. TNJ.com: What advice would you give to other young entrepreneurs? Cortlon Cofield: Fail fast and find a mentor! The wonderful thing about being a young entrepreneur is that you have so much time ahead of you to fail and get back up again. What will help you get back up is finding a great mentor. My mentor has helped me through so much throughout my business career and continues to give me invaluable advice to this day. I know I wouldn?t be where I am without him. TNJ.com: If there is something you can change, what would it be? Cortlon Cofield: Not reading more earlier in life. After college, I didn?t pick up a book for years because I thought a college degree was the end of learning. This couldn?t be further from the truth! The average CEO reads 50 books a year and now that I?ve made reading a daily habit, I now see how much more I have to learn. TNJ.com: The financial sector seems to be changing a lot lately, especially with cryptocurrency. How do you keep up? Cortlon Cofield: The financial sector is a fast-moving industry with technological advancements that are changing things rapidly. I have a set of podcasts and websites that I listen to and read daily (Wall Street Journal, Morningstar, etc.). If you don?t do this constantly, you will be left behind. Cortlon Cofield: My main goal for 2018 is to be the #1 millennial financial planner in the world. I want millennials across the world to know that they can get the help that they desire and know exactly where to go to find it. That is my life’s goal and I won?t stop until it?s achieved.